Ears for Murder is the winner of the 2018 DWAA Maxwell Award in the Fiction, Young Adult or Humor category! So much has happened since I embarked on my journey of becoming a writer many years ago. My life is best defined by Robert Frost’s poem, “The Road Not Taken.” To paraphrase: “Two roads diverged in a yellow wood… I took the one less traveled by. And that has made all the difference.” I did take the less trodden road and, though Frost never mentioned how twisty and bumpy that divergent path often can be, I have never regretted my decision to travel upon it. When I dreamed of being a writer as a child and decades later took the first steps toward achieving my dream, I never could have imagined the countless blessings that would come my way. I have published stories and books about what I love most in the world, dogs. 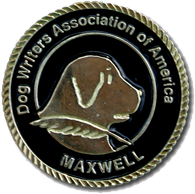 I have been privileged to receive three Maxwell Awards and be a finalist twelve times for this prestigious national award by the Dog Writers Association of America for the best writing on the subject of dogs. My third Maxwell was awarded for book #5 in the Beanie and Cruiser Mystery Series, Ears for Murder. Those marvelous medallions engraved with James Thurber’s famous hound dog are pretty swell bling for a dog writer, especially one who adores basset hounds as much as I do. Through writing about dogs, I have had the pleasure to meet many interesting people and to share my pooch passion with other dog lovers. My book sales have helped raise money for animal rescue groups, which pleases me greatly because I have rescued quite a few homeless pets of my own. My series is included on the AKC Best Dog Books list with many of the classic books about dogs that inspired me to want to write them myself. It doesn’t get much better than that. In addition to the Beanie and Cruiser mysteries, I have published a historical thriller titled The Secret of Bramble Hill. It is the first book I ever wrote, which was inspired by my travels in England in the early 1990s. Setting aside the first draft of the novel while continuing to work on other projects, I went on to write and publish a mystery series, nonfiction books, and hundreds of magazine articles. But that unpolished manuscript was always in the back of my mind. I worked on it from time to time, revising the book until I was finally satisfied with it. As it happens, a publisher liked it, too. Never fear, fellow dog lovers; there’s a canine in the book.